My 4-year-old Halli could color and work on art projects all day long. She spends most of her time at the kitchen table coloring. It has been so fun watching the creative side of her come out. Maybe it’s just because I’m her proud mom, but I think she has amazing coloring and drawing skills for a 4-year-old. I am always trying to find new ways to keep her imagination and love of art growing. This holiday season if you have a budding little artist Blendy Pens have been our new favorite thing to color with. 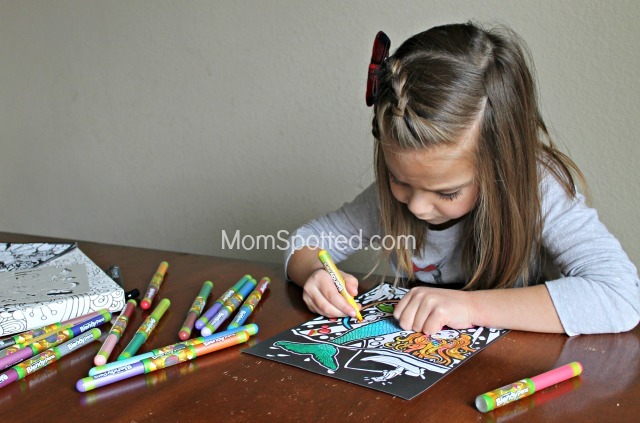 Blendy Pens from Chameleon Kidz have added a new twist to coloring. They are markers that are color changing and have dozens of color combinations. 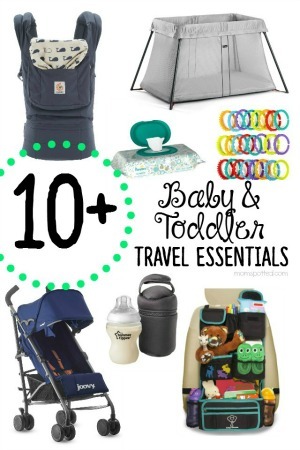 I have honestly loved these as much as my kids! Two markers easily snap together in the “fusion chamber.” Then you slightly twist the markers in opposite direction and color transfers to the marker on the bottom. It is so amazing! Halli loves that she can color with her favorite colors in one marker! She loves mixing pink and purple together. After giving her Blendy Pens a little twist her pink marker transfers over to the purple marker. 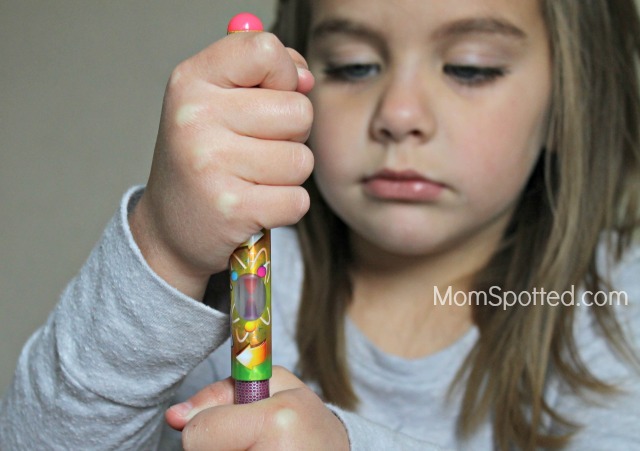 Then when she starts coloring her marker starts pink and gradually blends into a beautiful purple! Blendy Pens make the most beautiful gradient colors. I also really love that these pens have been educational. If we put a red and yellow marker into a fusion chamber, then start to color Halli sees what happens when those two colors mix. The pen starts out red, then slowly blends to orange, and then yellow! She has been fascinated by what colors are made when others are mixed together. Blendy Pens come in different kit sizes. There is a Jumbo Kit with 24 markers, a Large Kit with 20 markers, a Small Kit with eight markers, and a Stationery Set with six markers. 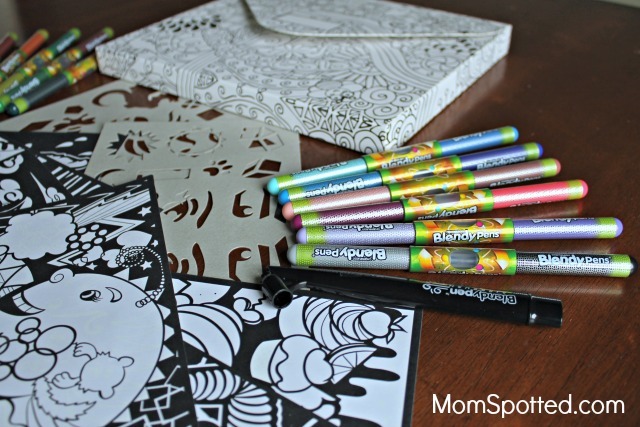 Each set comes with coloring pages to help you get started making beautiful artwork. We received the Jumbo kit and the Stationery Set. The Jumbo Kit also comes with an art portfolio, stencils, and a BlendyPen Airbrush. With 24 markers and 12 color chambers, Halli loves that she can create any color combination she desires with the Jumbo Kit. 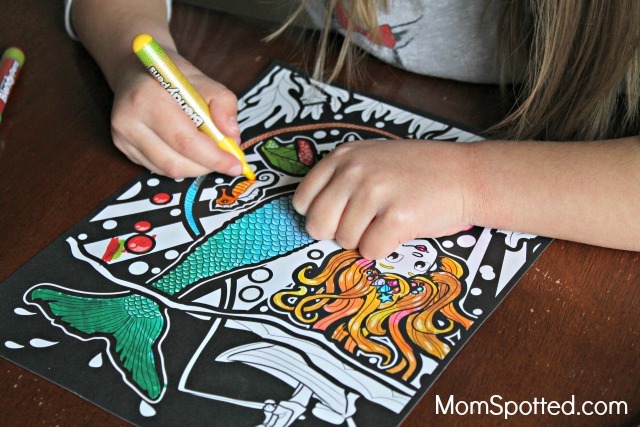 As soon as she saw the mermaid coloring page she got to work. It was so fun watching her mix and match all the colors. The Stationery Set has been a staple in our church bag. Our first church meeting is an hour long and we try to pack our bag full of things to keep her busy. Blendy Pens have been just what our bag needed. 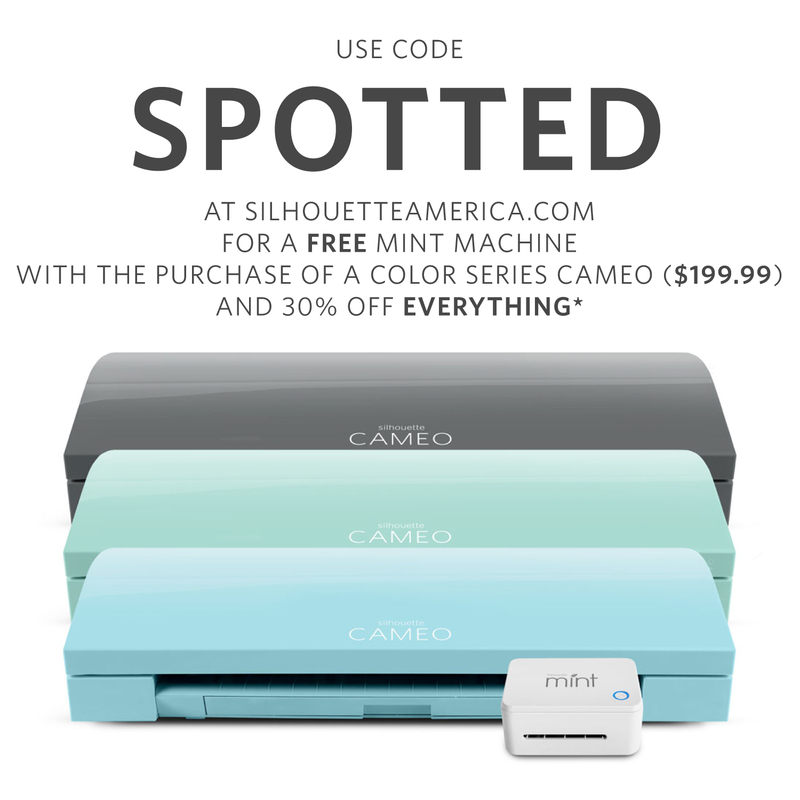 The Set comes with 6 markers and 3 color chambers, making it a perfect size to take on the go. It also comes with 3 small coloring pages. She will sit and quietly color the entire hour snacking on goldfish. Other moms and kids have taken notice of her coloring and asked what she is coloring with because it looks so pretty and fun. Blendy Pens definitely take her coloring and drawing to another level. The Stationery Set is also the perfect size to slide right into a stocking this Christmas. To be totally honest, I am not usually a big marker fan. Halli is pretty meticulous at coloring. She is so careful at keeping her drawings only on paper, but I shudder to think of marker on her hands, or clothes that won’t come off. 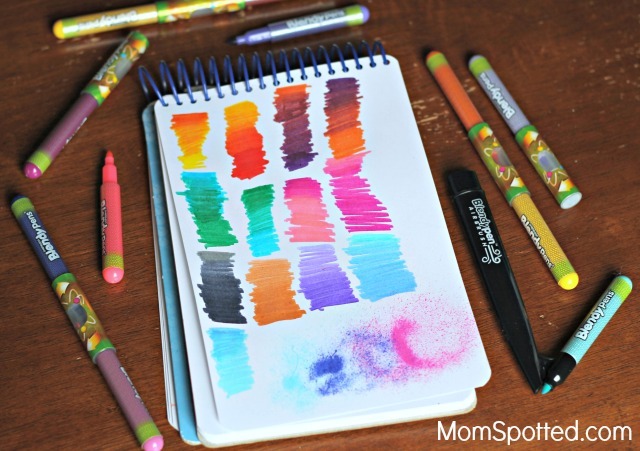 I use to hide our old markers at the very top of our arts and crafts closet, but Blendy Pens are washable! So Halli can color with Blendy Pens as much as she wants and if she happens to have an “oops” on her hands or clothes it has washed right out no problem. I cannot say enough good things about Blendy Pens. 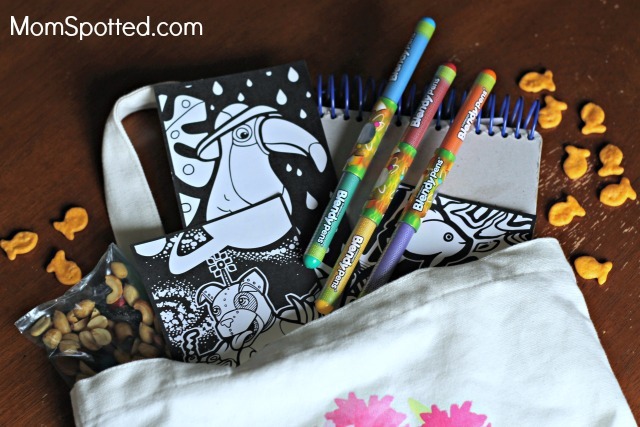 They would make such a fun gift for any of your kids who love art, teenagers, or even an adult who loves coloring. They would also be so great for anyone who has a talent for hand lettering. 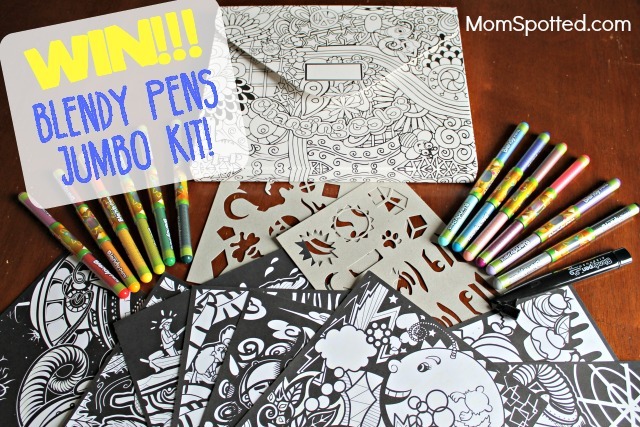 Blendy Pens will quickly become an arts and crafts favorite for your entire family. 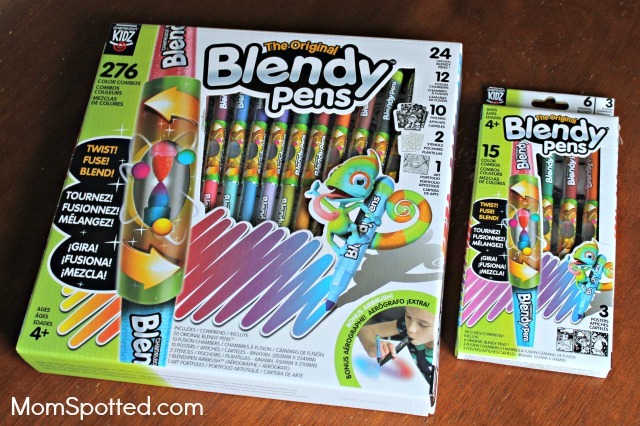 Right now (1) Mom Spotted reader has the opportunity to win (1) Blendy Pens Jumbo Kit. Contest ends 12.11.17 at 11:59 pm. For Official Giveaway Rules click here. U.S. Residents only. These pens look like a lot of fun for my daughter and son. Think that Ethan would like these. I think my boys and I would love these pens for the holidays! I would gift these blendy pens to my grandson. These would be for my daughter. Great Christmas gift idea! My daughter would love to color with these! I would give these to my daughter. She would love them! My coworker’s little girl is a super artist she would love these. I would gift to 2 little sisters. My granddaughter loves art, this would be a spectacular gift! I would give this to my very artistic niece. My daughter would love to win this awesome art set! These would be for my two daughters to share. these would be perfect for my daughter. She is so into art and drawing she would love these. I’d give them to my niece Chloe. I would gift these to my nice. Thanks for the chance to win. I would give blendy pens to my niece and nephew to enjoy. 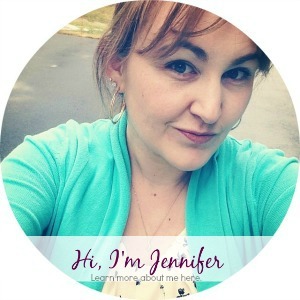 I would gift the Blendy Pens to…me! I love to color and these look like they would be so fun! I’m trying to win for my son. He loves arts and crafts and I know he would have a blast with these. I’d love to get this for my daughter! She’s my little artist and would love these! My youngest would love these. He’s such a creative little colorer! i WOULD GIFT THEM TOO MY NIECE BECAUSE SHE LOVES TO DRAW AND COLOR. I would gift them to my grandson and I so we could color together. 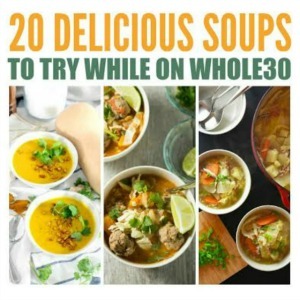 I’d give them to my daughter – she would love them! I would give them to my daughter who loves art! I’d give these to my daughter who loves to color. My daughter would absolutely dig these!! I would give them to my grandson. I would give these to my Grandsons. I’d give these to my 6 yr old daughter. She loves art work! I would gift this to my daughter. She is all into anything crafty! I’d keep them for myself… I do a lot of adult coloring pages and would like to play with these Blendy pens. I’d like to gift this to my youngest step-daughter. I think she’d really like it. Thanks. My youngest daughter would really enjoy these! 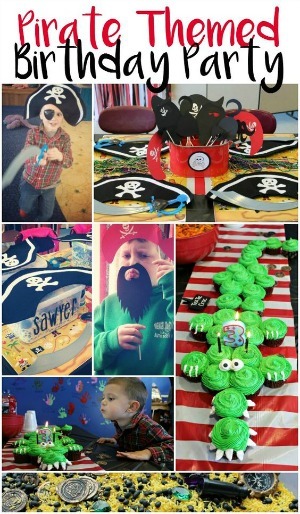 My great nephew and great niece are crafty. I would love for them to have these. I would gift these to my mother-in-law who would get a kick out of them. She loves working on her adult coloring books but has developed arthritis in her hands so the larger pens would work better for her. I would gift this to my neighbors children. I would get this for my daughter! She would love it!! I’d gift these Blendy Pens to my 2 granddaughters (sisters). I’d be giving Blendy Pens to my girls! They would love them! I would love to share with my niece!